Beautifilly appointed house with lush landscaping. Electric gated drive. Gas BBQ. Great Audio/Video system. Fully equipped kitchen. Tumbled marble bath. Outdoor redwood shower. 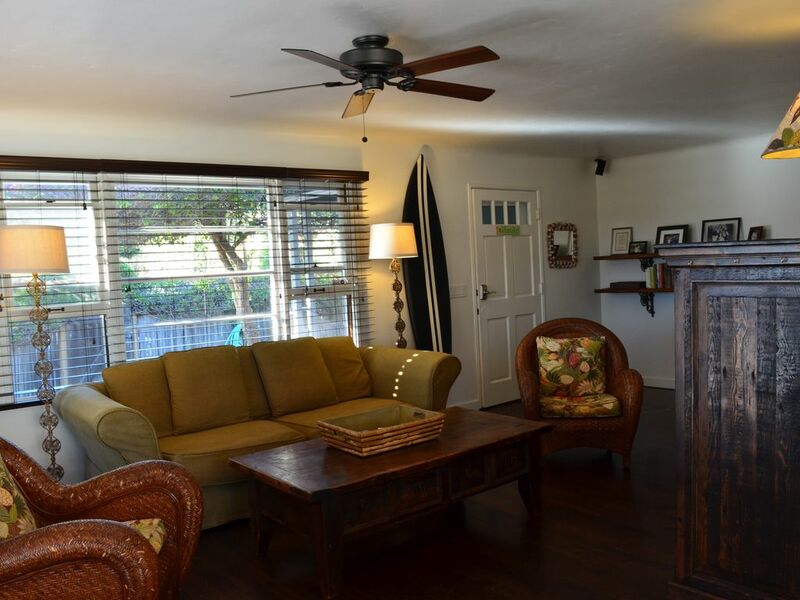 Close to shopping, Montecito, tennis, beach and zoo. Master bedroom has queen bed. 2nd bedroom has two twin beds which can be converted to a King. Wireless DSL. You can walk/bike to Montecito Village and shopping/restaurants/beach. Downtown Santa Barbara is only 2 miles away! We are a 3rd generation California family with a long family history in Santa Barbara. We love the mountains and the ocean. It's in a great Santa Barbara location. Our house is quiet and convenient to both Montecito and Santa Barbara. We stock the house with spices and cooking oils. The Santa Barbara Tennis center is at the foot of our street. 2 short blocks away. There are many great golf courses in Santa Barbara. Glen Annie is my personal favorite.